Its profiled hull, propellers and powerful engine allow high speeds(up to 77Km/h underwater). It was first designed on Lego Digital Designer. Compared to my 4.1 version, the hull now mesures around 148,5 centimeters, instead of 105 centimeters, for about 21 kgs(almost 8000 parts). Thanks for watching and telling me what you think of Titan! The access hatche to the torpedo room. Some clamps, mounted on a rail and hydraulic system, help handling torpedos until they are in tubes. On the left top, one of the two waterproof emergency doors, in the case of a hull breach. The clamp system slides this way. Close up of the conning tower. Inside the conning tower, this is the wheelhouse. Conning tower's roof, with access hatche, periscope, communication antennas and radars. On the rear of the conning tower, a pressurized sas allow underwater operation. Through the heavily armoured side windows of the hull, the control room. Because I wanted some strong basis for my conning tower, this is the only part of the sub you can't access directly. It's also difficult to take proper pics inside this part, so, I've included pictures of the LDD model with all the side hull hidden, in order for you to see properly the control room. From the left to the right: the crew's quarter, the control room and the torpedo room. Under this hatche, the Captain's room and the crew's quarter. Here is the Captain, having some rest. Under the Captain's chair, a hatch allow going downstairs to the crew's quarter. The ladder leading to the crew's quarter. On the right top, notice the second emergency waterproof door, separating the crew's quarter from the engine room. On the left, the combined toilets/shower. On the left, above the combined toilets/shower, the bunk beds. It's impossible to tak pics under these transparent parts of the hull, I'll show you later. These two heavy armoured hatches protect the retractable heavy machine gun and the escape pod. The heavy machine gun deploys. It can adopt a lot of angles. Under the heavy machine gun turret, the escape pod, in case of critical damage of the ship. The lower hatche allow the crew to come in, the upper one allow to come out the module once at the surface. Two access sas on the sides allow to reach this area from the interior. Because it's impossible to take pics under the transparent parts of the hull, I've included pictures of the mounting to show arround the escape pod area, with the two access hatches. This is the engine room. In red, the nuclear reactors. In yellow, the powerful electric engine, linked to the propellers. Notice you can see the nuclear missiles through their transparent silos, from the interior. Some close up of the rear, with its dual propeller system. Couldn't resist to appear with my sea monster! Hope you've enjoyed your trip with Titan! Hey, where are you! Lot of time without knowing your whereabouts! OMG, this is the best thing ever to happen to me, I like it better than almost anything else!! Can you post something like a video tour for the Titan, just because it is so amazing (pretty please)? This is incredible! You obviously put a ton of thought into the many brilliant details. Bravo! Hi! I still like it, because it inspired me for my submarines. I suggest that you take a look at em. They are quite different in stile, but my newest one is 200+ cm:) Critics are very welcome. H� Jay!! Come see my new U-boat!! The type VIIB! I love it! I would purchase this for like, a million bucks! Wicket sub! Isee why its called titan. I can't believe what I have just seen. The details, the size, the look. Thank you so much for the time you have taken to build this. You have amazing skills! That is a very impressive build and I like the fact that its in mini fig scale too. Quoting Rahkshi Pinkerton How long did it take to build this submarine? Epic.., and Epic..! + Epic..! that thing is HUGE! great detail work! overall exellent MOC! How long did it take to build this submarine? Outstanding job! You have really done some neat things with this creation! More phtoshop! I want to see it sailing into port! I love this thing! Attack! Quoting Michael Rutherford More phtoshop! I want to see it sailing into port! I love this thing! Attack! You might want some stories, with Titan... Attack! Once again, you've told me how much you loved Titan! This have been straight to my heart! Thanks you everybody for supporting me! Quoting Risa Kramer I was just watching the Hunt for Red October and thought I might try to build a sub. Yours is truly inspiring. Quoting Adam Passey how did you get so many of the same colored legos? Quoting The Pied Pauper $$ So much detail! It's hard to comprehend! I repaired subs during my time with the U.S. Navy, so I know how cramped some of the spaces can be. You did an incredible job with this! So, you mean my build is quite realistic! Thanks, Dude! Quoting Daniel Brilliant I love the detail on the inside and the level of thought that went into the design. The scale of this project is also very impressive. I wonder if it might be possible to give it a smoother exterior by using some of the rounded lego pieces, such as part #2572, #6002 and #30562 in an exterior shell built perpendicular to your existing hull. I'm not sure if those parts come in black though. could you show me links, to these parts? Thanks! Quoting Lego 4 Life About your question, of course you can. Quoting Silent MountainRanger Wow....Thats about all I can say. I love the crew quarters, most people would just skip those, it adds a lot a realism with crew quarters, the nuclear converter, and lots of other details. Love the kithcen/galley to! Quoting Mister Bones Wow.....that is brilliant! Lov ethe main pic, and what a beast that thing is! Great details all over that bad boy. PS: Love the gladiator mask on the shelf. many thanks, Simone! I'll come and check your ones! I was just watching the Hunt for Red October and thought I might try to build a sub. Yours is truly inspiring. Absolutely incredible! It sure is packed with tons of little details! Superb work! Hey Jay, I thought you might like to see this newest creation. http://www.mocpages.com/moc.php/313339 The Titan definitely served as inspiration for some of the interior parts. I would love to hear what you think. Merci de partager votre travail merveilleux. S'il vous pla�t continuer � partager votre talent incroyable et illimit�e. But mommy! I wantz to be like that dude with the big rubber ducky! how did you get so many of the same colored legos? So much detail! It's hard to comprehend! I repaired subs during my time with the U.S. Navy, so I know how cramped some of the spaces can be. You did an incredible job with this! I love the detail on the inside and the level of thought that went into the design. The scale of this project is also very impressive. I wonder if it might be possible to give it a smoother exterior by using some of the rounded lego pieces, such as part #2572, #6002 and #30562 in an exterior shell built perpendicular to your existing hull. I'm not sure if those parts come in black though. About your question, of course you can. Great job, You've taken full advantage of the impressive size and packed it with amazing features! I love the shape, and every detail drips with realism. Spectacular!! I love your building style, same on the Posiedon. Thankyou for your comment on my u-Boat. keep up the amazing work!!! Wow....Thats about all I can say. I love the crew quarters, most people would just skip those, it adds a lot a realism with crew quarters, the nuclear converter, and lots of other details. Love the kithcen/galley to! Wow.....that is brilliant! Lov ethe main pic, and what a beast that thing is! Great details all over that bad boy. PS: Love the gladiator mask on the shelf. Quoting Cody G That edited pic is awesome! Well done! Quoting El Barto ! Thanks, Cody! Oh wait, oops... A little collaborative project, you could call it an El Animal Production! Ah ah ah!!! Many thanks again, dude! Didn't have time yet to make you some realy good pictures! My priority goes to Poseidon build, because no much time left for ordering on design by me! Thanks, Cody! Oh wait, oops... A little collaborative project, you could call it an El Animal Production! That edited pic is awesome! Well done! Quoting Jon B Outstanding! Really enjoyed looking at this one, and love the interior detailing. Great build! Quoting Matthew Sylvan Thanks for all the comments Jay! Your ship's size is astounding. You put a lot of detials into this beauty. The interior just makes it even better. Btw, I hope you can finish your other project in time. Outstanding! Really enjoyed looking at this one, and love the interior detailing. Great build! Thanks for all the comments Jay! Your ship's size is astounding. You put a lot of detials into this beauty. The interior just makes it even better. Btw, I hope you can finish your other project in time. Salut Jay, je te remercie de laisser un petit comment a chaque fois c'est tres appreci� et ca m'encourage.Il faut que je te fasse une confidence,depuis que j'ai vu ton sous-marin nucleaire et tout ses details qui sortent de l'entendemment, je suis hant� par ce bateau.J'y pense a presque tout les jours pour toute sorte de raison et c'est particulierement troublant considerant que je n'ai aucun interet particulier dans le naval. Quoting Luke smith yeah i understand its hard to come across all those pieces!! If you don't mind me asking how much did you pay? yeah i understand its hard to come across all those pieces!! If you don't mind me asking how much did you pay? Many thanks dude! I'm afraid I took the overpriced solution! I was back to lego and did not know how to do! Quoting El Barto ! Still not satisfied with this pic? The problem with something more "realistic" as far as submarine photos, it will make it difficult to see, especially in the little thumbnail shot. Anything specific in mind? Still not satisfied with this pic? The problem with something more "realistic" as far as submarine photos, it will make it difficult to see, especially in the little thumbnail shot. Anything specific in mind? That's so cool! Titan loves to hear that! Quoting vincenzo Sciortino H�! Jay I think about put light in my u-boat and i see that you said you will maybe put lights you too in your'e sub this will be very cool! H�! Jay I think about put light in my u-boat and i see that you said you will maybe put lights you too in your'e sub this will be very cool! Wow cant belive motd brought this thing up so many likes! Quoting Austin Durick Wow cant belive motd brought this thing up so many likes! Quoting sma stache I forgot to say, I see Maximus' mask from Gladiator in the background, that is so AWESOME!!! I want it. My favorite movie of all time! Gimme Gimme Gimme :-) lol. You have a lot of cool movie memorabilia. Quoting Builder Allan Very, VERY awesome indeed.. I am envious, i must admit. I want this on my shelf! If you need ideas for a future update i would like to suggest a silent drive like the one the fictional Red October has :-) Oh, by the way i think 8000 pieces would be about a third of my total amount of bricks - and that's just for your sub! :-O With the black pieces i have i could - maybe - build the conning tower. Quoting LegoBoy 12 Freaking awesome dude! How many pictures you take of it? WOW I just had to comment on this again;D The detail is amazing.....5/5!!! WOW it's sooo awesome and big!! Thanks, my friend! I always asked how a MOC became MOTD! Do you know how? Popularity? Votes? ...? That Behemoth is incredible!Congrats on MoTD! Quoting RiddckNL DWF could you give us a downloadlink please? because you made it in LDD we could order it and i would love to! Thanks! The mistake is fixed! Help yourself! could you give us a downloadlink please? because you made it in LDD we could order it and i would love to! Great MOC. I'm a big fan of playable MOCs in minifig scale, and this is one of the best. Awesome work. Awesome! Congrats on MOCD this sub deserves it. Conratz on MOTD dude! Crazy MOC! Freaking awesome dude! How many pictures you take of it? Very, VERY awesome indeed.. I am envious, i must admit. I want this on my shelf! If you need ideas for a future update i would like to suggest a silent drive like the one the fictional Red October has :-) Oh, by the way i think 8000 pieces would be about a third of my total amount of bricks - and that's just for your sub! :-O With the black pieces i have i could - maybe - build the conning tower. Really well done man, you have deserved this alot. congratz! And then it gets MOC fo the day! Congratulations! Congratulations on MOC of the Day! I forgot to say, I see Maximus' mask from Gladiator in the background, that is so AWESOME!!! I want it. My favorite movie of all time! Gimme Gimme Gimme :-) lol. You have a lot of cool movie memorabilia. Just purely amazing! I'm speechless on how you fit so many detailed features inside of it. It also has an amazing outer body shape, just jaw dropping! Wow this is amazing!!! Well done:) Oh and thanks for commenting on my stuff!!! FINALLY! A shower in which you can do your business! That's my idea of PROGRESS! Hey man, it is sad about the pictures...I have a link to my Flickr account on my home page until the guys get it fixed. I had seen this a while back in the "It isn't rocket science" group and really liked it. Just noticed today I didn't add you to one of my favorites...so I took care of that. Cheers, good building to ya! Quoting Tommy Mizzone I always forget how cool this is... how much money was it?? :) I know how costly Ldd is!! I always forget how cool this is... how much money was it?? :) I know how costly Ldd is!! Quoting Jon Foulkes Very nice model my friend. Go the mighty All Blacks!! That's the biggest lego model I've seen - how many pieces? Thanks, buddy! 8000 parts for Titan! wow... thats huge. i dont have the peices to make subs that big, so all of mine will be in miniature scale. Only one word. WOW! OK, some more: This is an amazing MOC with so many details, just unbelievable. Thumbs up for this one! Engine room, missiles, torpedos, crew quarters - You name it. 8000 parts, that's amazing! Very nice model my friend. Go the mighty All Blacks!! That's the biggest lego model I've seen - how many pieces? Quoting Tom Nelson WOW, that is some serious MOCing there. Love the SNOT. Great work!!! 5.5 on the scale. Thanks Tom! You do a great work too! WOW, that is some serious MOCing there. Love the SNOT. Great work!!! 5.5 on the scale. Quoting David Calvet Bon, j'ai enfin pris le temps de regarder les nouvelles photos. Il est vraiment extraordinaire ce sous-marin, surtout quand on voit sa vraie taille sur la derni�re photo ! Bien s�r ce que je pr�f�re c'est l'int�rieur: il y a tellement de d�tails... Maintenant, j'attends avec impatience la base secr�te, qui a int�r�t � �tre fichtrement grande pour accueillir un monstre pareil ! Jay il est tou simplement superbe du tr�s bon travail!!!! Bon, j'ai enfin pris le temps de regarder les nouvelles photos. Il est vraiment extraordinaire ce sous-marin, surtout quand on voit sa vraie taille sur la derni�re photo ! Bien s�r ce que je pr�f�re c'est l'int�rieur: il y a tellement de d�tails... Maintenant, j'attends avec impatience la base secr�te, qui a int�r�t � �tre fichtrement grande pour accueillir un monstre pareil ! Wow! This thing is a monster! Quoting Austin Becht Excelent. Also you need to make your nation and upload your statistics if you want to play Conflict. If not you can be a builder for someone, making your own vehicles out of your own ideas but letting another player use them in the game. If you just want to be a builder you could be a builder for me as i have no ally or builder but people like Nemisis have 2 builders and the max 1 ally. If you wanna play i would like you as my ally if you are fine with that. Excelent. Also you need to make your nation and upload your statistics if you want to play Conflict. If not you can be a builder for someone, making your own vehicles out of your own ideas but letting another player use them in the game. If you just want to be a builder you could be a builder for me as i have no ally or builder but people like Nemisis have 2 builders and the max 1 ally. If you wanna play i would like you as my ally if you are fine with that. Quoting Henrik Hoexbroe -And a big congratulations to you too, for winning in the mocie awards! Quoting Matthew McCall Wow. This is probably the best sub of seen on MOC pages. It's huge, and it has both inside and outside detail. Great job! -And a big congratulations to you too, for winning in the mocie awards! Wow. This is probably the best sub of seen on MOC pages. It's huge, and it has both inside and outside detail. Great job! Quoting Franko Komljenovic Woow this is really huge creation. The interior is brilliant. Beautiful. Woow this is really huge creation. The interior is brilliant. Beautiful. Quoting christophe corthay Congrate dude for the Mocie's !!! Quand meme, ta derniere photo ou tu poses avec ton titan.... elle me fait toujours marrer !!! un petit complexe ?? MOUHAHAHAHAAAAA !!!!! Congrate dude for the Mocie's !!! Quand meme, ta derniere photo ou tu poses avec ton titan.... elle me fait toujours marrer !!! un petit complexe ?? MOUHAHAHAHAAAAA !!!!! Quoting Krazy Kastle Krak Guy Autant incroyable que cel� puisse para�tre, j'avais oubli� de t'ajouter � mes Favourite Builders! Voil�, c'est chose faite, Mr Froggie! Quoting Gab BOIDOT salut ! �a fait un bail ! jolie image principale.. la version 2 de mon TITAN "Gun Griffon" est disponible (la partie 3 est en d�j� en cours..) j'attends ton commentaire avis�! Merci Gab! Je vais voir Titan - V2 de suite! Autant incroyable que cel� puisse para�tre, j'avais oubli� de t'ajouter � mes Favourite Builders! Voil�, c'est chose faite, Mr Froggie! Quoting El Barto ! Congrats, Dude! Quoting Master Shifu Leo J That's ... a ... gigantic ... huh? oh, right ... submarine! Congrats for winning in the MOCie awards! Quoting Ced The Clever Congratulations on your MOCCIE win! Thanks Yuri! I come to see that now, buddy! Thanks a lot buddy! Salut Jay, mes plus vives congratulations pour ta victoire aux MOC Awards 2011!!! Quand m�me, deux frenchies qui gagnent et deux membres des Froggies, c'est vraiment super!!! That's ... a ... gigantic ... huh? oh, right ... submarine! Congrats for winning in the MOCie awards! Congratulations on your MOCCIE win! Quoting The Admiral I sense subliminal messeging... joking =P Great MOC!! Fantastic detail, lots of features, and it HUGE!! I didn't think a minifig scale sub could be that big. Im working on making an minifig scale SPHA-T. Absolutly GIGANTIC when the baseplate is laid out...but it will be quite a while until i make a decent amount of progress. Well anyway, great MOC!!! GREAT WORK!! I sense subliminal messeging... joking =P Great MOC!! Fantastic detail, lots of features, and it HUGE!! I didn't think a minifig scale sub could be that big. Im working on making an minifig scale SPHA-T. Absolutly GIGANTIC when the baseplate is laid out...but it will be quite a while until i make a decent amount of progress. Well anyway, great MOC!!! GREAT WORK!! Quoting Mitchell Kirkman Very Very good.the best I have seen on Mocpages. How much does it cost? Well,using brilink and co, doing just one order, you might pay 1500� Maybe less! I've made so much updates! Very Very good.the best I have seen on Mocpages. How much does it cost? Quoting miguel granados very nice and very detailed. its cool that you can make a full hull model without using plate pieces extensively. also i love the interior with the missiles and captains quarters. overall big and detailed very nice keep up the good work. Quoting Matt ;P Dude,this is epic.There's nothing att all wrong with it;it's perfect! Quoting El Barto ! Nice main pic, Dude! I wrote you a note over in the Rocket Surgery group. Ok Dude, I'll try that! Cheers, buddy! very nice and very detailed. its cool that you can make a full hull model without using plate pieces extensively. also i love the interior with the missiles and captains quarters. overall big and detailed very nice keep up the good work. Dude,this is epic.There's nothing att all wrong with it;it's perfect! Dude, as always an epic and awesome creation! One of these days shes going to end up to big for your den. I'm also digging the Kong vs. V-rex and the Aliens statues it appears we have similar taste in what should be displayed proudly in ones home. Nice main pic, Dude! I wrote you a note over in the Rocket Surgery group. Quoting James Bond Beautiful.Just plain beautiful. I can't believe I haven't commented on this before! Keep up the good work dude! Quoting Sniper Rifle This is excellent work, Jay. I have a question. In the engine room, from what kind of pieces are the red nuclear reactors made? It looks like some kind of hollow cone at the top, and a cylinder below. I have not seen these pieces before. Would I be able to buy them on bricklink? Quoting Mark Rodrigues Fantastic! Thanks for taking me on an incredible journey. Regards, mark. Beautiful.Just plain beautiful. I can't believe I haven't commented on this before! Keep up the good work dude! This is excellent work, Jay. I have a question. In the engine room, from what kind of pieces are the red nuclear reactors made? It looks like some kind of hollow cone at the top, and a cylinder below. I have not seen these pieces before. Would I be able to buy them on bricklink? Hey Jay, j'ai invite du monde pour le groupe mais ils peuvent pas venir vu que c'est prive.... on fait comment pour qu'ils rentrent dans le groupe ??? Fantastic! Thanks for taking me on an incredible journey. Regards, mark. Quoting Delta Hybrid Epic creation you got there! Don't know if anyone has asked this yet, but how long did that take to make? Thanks! A little more than 6 months since I've started to design it in LDD. Quoting AA (Noname) Well done, Jay. It's a great creation (pun intended). Thanks! Didn't see the pun, could you explain? Quoting Ben (Flare) . Incredible! Very nice work, that thing is huge! Well done, Jay. It's a great creation (pun intended). Epic creation you got there! Don't know if anyone has asked this yet, but how long did that take to make? Incredible! Very nice work, that thing is huge! Quoting david mason this is amazing, wish i could build a sub like that, how muh did that cost to make? Quoting Steve Ward this is awesome! a lot of dedication, time and effort has gone into this, and it's clearly paid off! this is amazing, wish i could build a sub like that, how muh did that cost to make? this is awesome! a lot of dedication, time and effort has gone into this, and it's clearly paid off! Thanks, Dude! I'll check out with pleasure! Quoting tj kronen thanks jay, glad I got to see the updates! the captain's quarters is awesome... very well done how you got it to fit right in there and how the hatch opens and the entry way - exit to the lower part of the ship is great. the retractable machine gun is sick! I also like the torpedo room and the bay openings at the front of the sub are just crazy good... i spent a while checking everything out, when i make a sub or a ship in the future... you can bet i will be asking you to borrow some of your ideas!! Quoting Freeling ++ Over 200 I like its??!!? Amazing!! And LUCKY!!! Over 200 I like its??!!? Amazing!! And LUCKY!!! This MOC is just crazy..! Can't believe you made in fully in Lego DD first. :O It's huge with tons of details, you don't see that much these days. Are you still going to improve it? You�re right this is a "must see". The level of detail and the playability is superb. I really like your small details like the captains bed and the tubes on the nuclear plant. With the words of Montgomery Burns: "excellent". By the way I understand it�s an Italian submarine -due to the pizza�s in the galley ;). thanks jay, glad I got to see the updates! the captain's quarters is awesome... very well done how you got it to fit right in there and how the hatch opens and the entry way - exit to the lower part of the ship is great. the retractable machine gun is sick! I also like the torpedo room and the bay openings at the front of the sub are just crazy good... i spent a while checking everything out, when i make a sub or a ship in the future... you can bet i will be asking you to borrow some of your ideas!! Quoting Green helmet spanish AFOL Many excellent designs. Either in LDD and real bricks. And thanks for making the instructions available. the only I think I dont find realistic is the windows in the hull, but this is a small tear in an ocean of quality. Congratulations!! Thanks very much, Mr Spanish AFOL! Your'right, my transparent parts on the hull are complete concessions to realism. I found it would be more cool to imagine a futuristic sub with that type of details. Quoting Steef de Prouw Well, the words epic and massive have already been used. This is some solid work man. I found me wondering after a dozen pictures or so if you had made an interior too, and I wasn't disappointed. You took the time to show every detail, inside and out, making it all the more interesting to watch. Very cool stuff. Many excellent designs. Either in LDD and real bricks. And thanks for making the instructions available. the only I think I dont find realistic is the windows in the hull, but this is a small tear in an ocean of quality. Congratulations!! Well, the words epic and massive have already been used. This is some solid work man. I found me wondering after a dozen pictures or so if you had made an interior too, and I wasn't disappointed. You took the time to show every detail, inside and out, making it all the more interesting to watch. Very cool stuff. Quoting DarkWolf 222 One of the best Mocs on MP today. Fine job! This is just epic epicness, its astounding the amount of work, time and detail you have put into this, it is really good, how many floors does it have? and probably a stupid question but does it float? anyway really excellent creation here. Quoting JS Can MASSIVE! Looks like you've added some more details and photos of the interior since I last saw this. Great work! Thanks Dude! Almost all the pics have been taken during the day, this time, with my shutters opened... Titan is not easy to take in picture, because of its colour! One of the best Mocs on MP today. Fine job! MASSIVE! Looks like you've added some more details and photos of the interior since I last saw this. Great work! Quoting Justin Saber-Scorpion Stebbins Ooooh wow, that really is impressive! Lots of details in the interior, and well, it's HUGE. Very nice work. Nice Gladiator helmet you've got there too. Ooooh wow, that really is impressive! Lots of details in the interior, and well, it's HUGE. Very nice work. Nice Gladiator helmet you've got there too. Quoting Lee Hardwick Fantastic work, great shape and form on the outside and amazing detailing on the inside. Did you draw any plans or just got stuck in with the LDD? Thanks very much, Lee! I just got stuck in LDD! Lots of improvisation here ! Quoting Zac . i am looking for some inspiration and i see you have got bunk beds,i (talking from lack of space experience) would have made them less space consuming so probably fold out,what do you think? Of course they could be more space "optimized" Zac, do you want me to make a special MOC of my bunk beds inside the crew's quarter, for you to see how they'are on my LDD model? Fantastic work, great shape and form on the outside and amazing detailing on the inside. Did you draw any plans or just got stuck in with the LDD? i am looking for some inspiration and i see you have got bunk beds,i (talking from lack of space experience) would have made them less space consuming so probably fold out,what do you think? Wow! This is realy good. The exterior alone is awe inspiring, but the interior blows me away! Again, great boat, Dude! My previous comment suggested taking her for a dive, and clearly, that's not practical. However, photoshopping this into an underwater scene I think will really portray this MOC to its full potential. I suggest studying some photos of any sub above and below the water, and seeing if you can recreate them with your boat. I'll invite you to the photoediting group where you can get started. Quoting Caleb Robinson, The MC Wow, this is totally going to the MOCies.... This is amazing. Oh and check out the Best story section. Wow, this is totally going to the MOCies.... This is amazing. Oh and check out the Best story section. I like it this way, thanks! Quoting Michael Rutherford This thing is a beast! If it were any bigger, you would be arrested for trafficking in weapons of mass destruction! I love it. And with full interiors. Incredible. It's terrifying. So� when do you build the dry-dock for it? Attack! Ha ha ha!!! Thanks Michael! I have several ideas about a "HQ" for Titan... ATTACK! This thing is a beast! If it were any bigger, you would be arrested for trafficking in weapons of mass destruction! I love it. And with full interiors. Incredible. It's terrifying. So� when do you build the dry-dock for it? Attack! Quoting Lance Alderson This is a truly amazing creation. The interior detail is marvelous. I really liked how all of the different compartments where accessible and integrated into the structure of the sub. Very good job. This is a truly amazing creation. The interior detail is marvelous. I really liked how all of the different compartments where accessible and integrated into the structure of the sub. Very good job. Quoting Todd Wilder Awesome work, Jay! Incredible details! LDD rules. Awesome work, Jay! Incredible details! LDD rules. Quoting A minute ago ... Incredible, the most detailed and amazing sub i have ever seen in Lego! The interior is awesome, and it looks great just on the outside! Quoting lone wolf I found this by a comment on someone else's creation. You weren't kidding either! This sub is BIG! Great job! I give it a ten out of ten! Quoting Justus Nelson absolutely incredible! i still want some (gonna make some money this summer!). very good. uh, does your crew have to hotbunk, or is there enough room in there for each man his own bunk, and do you have any gyroscopes? i love the details, tho! very good. vry, very good. how many crewman do you require, and what is the maximum and the skeleton of the crew? ALSO! build a drydock, maybe? that would be cool. spare missiles, oh! and you should allow for the palcement and viewing of fuel rods in the reactor, AND ISOLATE YOUR REACTOR ROOM IN LEAD!!!! HAHA. in a polaris and later subs, there would be tiny amts of radiation, but still, they isolated it. but very good job overall!!!! AND WHY IS MY BUDDY ICON NOT WORKING!!!!! Incredible, the most detailed and amazing sub i have ever seen in Lego! The interior is awesome, and it looks great just on the outside! I found this by a comment on someone else's creation. You weren't kidding either! This sub is BIG! Great job! I give it a ten out of ten! absolutely incredible! i still want some (gonna make some money this summer!). very good. uh, does your crew have to hotbunk, or is there enough room in there for each man his own bunk, and do you have any gyroscopes? i love the details, tho! very good. vry, very good. how many crewman do you require, and what is the maximum and the skeleton of the crew? ALSO! build a drydock, maybe? that would be cool. spare missiles, oh! and you should allow for the palcement and viewing of fuel rods in the reactor, AND ISOLATE YOUR REACTOR ROOM IN LEAD!!!! HAHA. in a polaris and later subs, there would be tiny amts of radiation, but still, they isolated it. but very good job overall!!!! AND WHY IS MY BUDDY ICON NOT WORKING!!!!! Quoting Gerry Burrows Very Awesome sub! I love all the detail and thought put into the entire design and build rather than just the outside. I always appreciate realism, functionality, and playability put into creations. Great job! Thanks very much Gerry! Always cool to have congrats from awesome builders like you! Very Awesome sub! I love all the detail and thought put into the entire design and build rather than just the outside. I always appreciate realism, functionality, and playability put into creations. Great job! Quoting Dave Kaleta I really appreciate the dedication this project must have taken. The playability is by far my favorite aspect, as you have not lost the element of Lego that drew most of us to it in the first place. Thanks Dave! Maybe a dedication similar to the one you had to build your awesome Wayne's Manor and its Batcave! One among a long serie of great Mocs! Quoting Bob the inconceivably invincible That's amazing, all the details... I can't quite think of how to finish that sentence.. I really appreciate the dedication this project must have taken. The playability is by far my favorite aspect, as you have not lost the element of Lego that drew most of us to it in the first place. That's amazing, all the details... I can't quite think of how to finish that sentence.. Quoting Gab BOIDOT Ouep appelle moi Gab.Enchant� J�r�me. J'ai chang� l'image sur le ZENITH pour que tu puisse voir ce qu'il done une fois peint(m�me si jamais mis de 2�me couche) A+ ! Oki, enchant� Mec! Je vais voir �a! Quoting IMPERIAL FLEET WOW! This thing is MASSIVE! You really put a lot of detail and effort into the shaping and the interior of the sub. I really like how it is playable and not just a display piece. Like me, I have not touched a brick in years, yet it seems our Lego skills are as if we had been building the whole time. That is why it is so awesome to be an AFOL! (Adult fan of Lego) Well done my friend! Thank you Sir! As an AFOL, I think I can now afford my passion! I wanted a big build, for my return to A.B.S.! Thanks for my efforts on the shaping, people often congrat me more on in its interior! Thank you for the kind comment on my greatest Lego, my friend! See ya! WOW! This thing is MASSIVE! You really put a lot of detail and effort into the shaping and the interior of the sub. I really like how it is playable and not just a display piece. Like me, I have not touched a brick in years, yet it seems our Lego skills are as if we had been building the whole time. That is why it is so awesome to be an AFOL! (Adult fan of Lego) Well done my friend! Quoting Gab BOIDOT Tu parles fran�ais? Quoting Gab BOIDOT I've just follow the link you gave in one comment. I don't regret that. I see all fotos but can't read all the comment and you replys. Think all as already being said.. just WAOUH. I especially love the turret ! MONSTER MOC, TITAN SIZE ! More people should have to follow your link(s). When I put first version of Titan(it was only an LDD model) on Mocpages, I had almost no comments. So firstly, I wrote a lot on people's MOC I liked(in particular big boats and big subs) suggesting to come to visite Titan too. Sometimes hard to be known on MOCpages! Thanks for your kind comment! Quoting Dreadnought o_o I like the sub, Maybe do some work to make it rounder. What are you going to do next, maybe a ship. I would like to see a minifig sized stealth ship on mocpages. I like the sub, Maybe do some work to make it rounder. What are you going to do next, maybe a ship. I would like to see a minifig sized stealth ship on mocpages. Quoting Marty Fields You certainly have quite a fan club now! Not surprising really considering your impressive effort. The two props do look more in keeping and I like the added details of the air-lock and removable captain's cabin. How about having a go at the "Seaview"? Great job. Thanks a lot Marty! I like to share it with great MOC builders like you! What is "Seaview"? You certainly have quite a fan club now! Not surprising really considering your impressive effort. The two props do look more in keeping and I like the added details of the air-lock and removable captain's cabin. How about having a go at the "Seaview"? Great job. Quoting A Dying Breed This is...insane. Great work on everything... the escape pods, hatches, nuclear missiles, everything. You, sir, have inspired me to get back into vehicles again instead of rifles. 5/5! This is...insane. Great work on everything... the escape pods, hatches, nuclear missiles, everything. You, sir, have inspired me to get back into vehicles again instead of rifles. 5/5! Quoting Mark Kelso As per usual, the director's cut is the better version! Love the additional detailing with the interior. It's an impressive MOC to begin with, but once you get a full tour of the inside, it becomes a jaw-dropper. Gotta say, the removable captain's quarters was a particularly cool idea - be fun to see a massive ship with all of the interiors done in a modular fashion like that. GREAT WORK! Quoting Krystek Pietrzak It is VERY big but also very well detailed. Excellent job here! Thanks Krystek! You're doing a lot of cool work too! It is VERY big but also very well detailed. Excellent job here! I like the interior and the curves on the front. Quoting cyberfrank 2010 j en crois pas mes yeux d entendre ca...IL ARRACHE TOUT!! !il est super!!! Quoting Hawx 163 163 Marrant! Il t'as fallu combien de temps pour le construire? Quoting Christian H. I like the interior and the curves on the front. Marrant! Il t'as fallu combien de temps pour le construire? As per usual, the director's cut is the better version! Love the additional detailing with the interior. It's an impressive MOC to begin with, but once you get a full tour of the inside, it becomes a jaw-dropper. Gotta say, the removable captain's quarters was a particularly cool idea - be fun to see a massive ship with all of the interiors done in a modular fashion like that. GREAT WORK! j en crois pas mes yeux d entendre ca...IL ARRACHE TOUT!! !il est super!!! Quoting Krazy Kastle Krak Guy Les mots me manquent, wow, quel niveau de d�tail, les int�rieurs sont �patants ! Un sacr� monstre ! Bravo ! Les mots me manquent, wow, quel niveau de d�tail, les int�rieurs sont �patants ! Un sacr� monstre ! Bravo ! Quoting cyberfrank 2010 ton link m ammene ici, c est pour les belles prises d interieurs? me torturer un peu? lol! ou les 125 i like it s ? lol! hey! il y as des commentaires interressants la dedans! des suggestions de pompiers? ..et 50 kmh...c est tout?...j imaginais plus...met lui un 4' rond avec une vitre, ajoutes au moteurs un turbo! lol! 200 kmh!!!!lol! c est supwer cool jay! et...je me doutait que tu t appelais...jerome! lol! je restait ,voila 2 ans a...st jerome!!!lol! Quoting Rodrigo Diaz Thanks for your comment. I've updated my page. Your Sub looks incredible. Fantastic interior detail. ton link m ammene ici, c est pour les belles prises d interieurs? me torturer un peu? lol! ou les 125 i like it s ? lol! hey! il y as des commentaires interressants la dedans! des suggestions de pompiers? ..et 50 kmh...c est tout?...j imaginais plus...met lui un 4' rond avec une vitre, ajoutes au moteurs un turbo! lol! 200 kmh!!!!lol! c est supwer cool jay! et...je me doutait que tu t appelais...jerome! lol! je restait ,voila 2 ans a...st jerome!!!lol! Thanks for your comment. I've updated my page. Your Sub looks incredible. Fantastic interior detail. Quoting Tommy Mizzone Thank you so much for all of the kind comments!! Every time I look at this sub I can't believe how huge it is!! Thank you so much for all of the kind comments!! Every time I look at this sub I can't believe how huge it is!! Quoting Suboken Project Without a doubt, this MOC is a prime example of the type of passion building with LEGO offers it's fans. You've created an amazing model and I bet it steals everyone's attention when they see it in your home. It reminds of the movie "The Hunt For Red October". Wouldn't it be great if you built the Red October to ship along side the Titan. Without a doubt, this MOC is a prime example of the type of passion building with LEGO offers it's fans. You've created an amazing model and I bet it steals everyone's attention when they see it in your home. It reminds of the movie "The Hunt For Red October". Wouldn't it be great if you built the Red October to ship along side the Titan. Quoting Matthew Novosad Amazing job! It looks sweet. My dad was a Navy man, more specifically in the engine rooms of Nuclear Subs. If you ever decide to take up another project of this size, I would recommend either the Agusta, or Carver, the two my dad was on. Thanks! I think I'd like to hear your dad about his experiences... Would be interesting! Amazing job! It looks sweet. My dad was a Navy man, more specifically in the engine rooms of Nuclear Subs. If you ever decide to take up another project of this size, I would recommend either the Agusta, or Carver, the two my dad was on. Quoting Justus Nelson also, you might read up on polaris and the newer subs. very good, i cant beleive it! i like it a lot. now, i want 20, my highests. how mch would this cost if i downloaded ur instructions on ldd and got it? What do you mean by Polaris and newer subs? If you wanna make it, no problem! I would be proud and happy you use my design! Just don't pretend it's yours! There is a small problem with last updates of lego digital designer: I couln't order it again without changing a few stuffs; for exemple, I had to order my second proppeller separatly on pick a brick: it is not selectable anymore in LDD! :-( I strongly suggest you take the file here: http://www.mocpages.com/moc.php/265665 because it has all my latest updates! (sorry, the captain's room has remained opened, in the model, but it's really easy to correct it!) Finally, the biggest problem in Titan: its price! A bit less than 2000�! (maybe less, because I've made too much separated orders! ):-S If one day you build it, I would be really pleased by a dedicacion to my ever best and biggest creation! ;-)! Quoting Justus Nelson Yes, um, sorry about being not-punctual. fire control is the target aquisition and missile firing. and now, i wont 15. haha, good job. and the emergency response team is fire fighters, and airlocks and the like. its... aaahhh... absolutely incredible. very very good. you oughta click on my picture and tell me how MY missile launcher is. hahaha. also, you might read up on polaris and the newer subs. very good, i cant beleive it! i like it a lot. now, i want 20, my highests. how mch would this cost if i downloaded ur instructions on ldd and got it? Yes, um, sorry about being not-punctual. fire control is the target aquisition and missile firing. and now, i wont 15. haha, good job. and the emergency response team is fire fighters, and airlocks and the like. its... aaahhh... absolutely incredible. very very good. you oughta click on my picture and tell me how MY missile launcher is. hahaha. Quoting Peter www.tirpitz.net Very good job, absolutely stunning! With only standard brick size (no plates) I know how difficult it is to build a nicely shaped hull. And with all the interior it's for sure one of the best ship models around here! Very good job, absolutely stunning! With only standard brick size (no plates) I know how difficult it is to build a nicely shaped hull. And with all the interior it's for sure one of the best ship models around here! Quoting Ethan Cook Awesome. Nice sub considering how hard it is to make one. A few ideas, minifigures (there are scuba diver pieces)and a flag of some sort maybe? Awesome. Nice sub considering how hard it is to make one. A few ideas, minifigures (there are scuba diver pieces)and a flag of some sort maybe? Quoting Matt Mason I'd seen this before, just from the links though. The amount of details inside this monster are mad! I'd seen this before, just from the links though. The amount of details inside this monster are mad! Thanks Zack! I also ask myself why always spaceships? why always starwars? Always WWII U-boot?... But very few big nuclear subs projects... And good ones! Happy to see others sub fans! Quoting Michael Bobrischew The level of detail is crazy! I can see that a ton of work went into this! Great job! Thanks Michael! I confirm! Almost 6 months since the first brick into Lego Digital Designer! Quoting DarkWolf 222 If only I could afford that many parts.... Nice work! The level of detail is crazy! I can see that a ton of work went into this! Great job! If only I could afford that many parts.... Nice work! Quoting Deus Otiosus Don't you mean by the space limitation being the size of the universe? Don't you mean by the space limitation being the size of the universe? Wow. Just brilliant. Fantastic attention to detail there mate. Thanks for the link! Quoting Justus Nelson I love it. i wish i had thwelve, and i might just try to find parts to do just that. very good job, but i might edit the colors of the reactors a little? just a thought, you might add fire control and navigational/ communications stuff, and an emergency situation response team (firefighters) I do love it though. Hi Justus, and Thanks! 12! wow! You don't like my nuclear reactor's colour scheme? I took what was orderable in Lego Digital Designer! There are a lots of navigation tools, in the control room, for exemple, and radars, sonars and antennas... There are some fire extinctors in each part, if it is what you mean by fire control. By suggesting this: "emergency situation response team (firefighters)". Do you mean small armed vehicles that would come out from the hull and defend the mothership? I love it. i wish i had thwelve, and i might just try to find parts to do just that. very good job, but i might edit the colors of the reactors a little? just a thought, you might add fire control and navigational/ communications stuff, and an emergency situation response team (firefighters) I do love it though. Quoting Caleb S Amazing!!! And you deffinitly have plenty of pics. Amazing!!! And you deffinitly have plenty of pics. Quoting MR. LEGO That thing is huge! How much time did it take you? I started designing it on LDD in half november 2010. Finished half april 2011... A last update is coming, I've put 2 propellers, now. That thing is huge! How much time did it take you? Quoting Dede Winters Wow, This is great on the inside and outside! Wow, This is great on the inside and outside! Wow Jay this is huge! Only thing I wouldnt do is build with black for the main colour. Nevertheless, this is a masterpiece! Awesome level of details man. Is this built in true minifig scale? Quoting Thoy Bradley Wow Jay this is huge! Only thing I wouldnt do is build with black for the main colour. Nevertheless, this is a masterpiece! Awesome level of details man. Is this built in true minifig scale? Quoting El Barto ! Awesome build, Dude, Inside and out! Does it float? Pictures underwater in a pool would be great! Awesome build, Dude, Inside and out! Does it float? Pictures underwater in a pool would be great! Quoting Cody G Wow! The shaping here is fantastic, and the amount of detail is amazing! I couldn't see how awesome this was from your other post, but now that I see it in its full glory, it is truly a wonder to behold. Wow! The shaping here is fantastic, and the amount of detail is amazing! I couldn't see how awesome this was from your other post, but now that I see it in its full glory, it is truly a wonder to behold. Quoting Jay Hoff Very nice work! You probably had to special order alot of Black LEGO like I did ('Arrival of the Emperor'). I think you should photograph it underwater.. it is just plastic after all! Quoting Scott Middleton That is so cool, I liked how you put detail in. Very nice work! You probably had to special order alot of Black LEGO like I did ('Arrival of the Emperor'). I think you should photograph it underwater.. it is just plastic after all! Quoting christophe corthay Enooooorme ton sous marin !!!!! ça a du être l'éclate suprême à faire cet engin et je vois que tu fais partie de ces malades mentaux qui font tout l'intérieur mais qui le cache ensuite !!! j'adore !!! That is so cool, I liked how you put detail in. Enooooorme ton sous marin !!!!! ça a du être l'éclate suprême à faire cet engin et je vois que tu fais partie de ces malades mentaux qui font tout l'intérieur mais qui le cache ensuite !!! j'adore !!! Quoting Marty Fields A BIG and impressive build. Nice to see another user of lots of black Lego! Can't help thinking, though, that a such a large submarine might need two propeller shafts as seen on subs like the Typhoon class. Love the detailing. Well done. Thanks Marty! I had already thought about it and I'm actually thinking on an easy and conveniant way to modify it! I thought about a second propeller or maybe a big turbine... I'll show you as soon as I've got my new design! Quoting Crimso Giger C'est Cyberfrank qui m'a conseill� de voir ce submersible et je suis pas de�u ! Tr�s impressionnant, de la forme g�nerale tr�s fid�le et ENORME, aux details innombrables de l'interieur. Tr�s belle realisation !!! Salut Crimso, et merci! Frank m'avait dit qu'il ferait ma publicit�, et je l'en remercie! Il parait que toi aussi tu habite en France? A bientot l'ami! Quoting Vinsay Oukache Tr�s beau travail, beaucoup de patience et d'abn�gation pour une r�ussite total. A BIG and impressive build. Nice to see another user of lots of black Lego! Can't help thinking, though, that a such a large submarine might need two propeller shafts as seen on subs like the Typhoon class. Love the detailing. Well done. C'est Cyberfrank qui m'a conseill� de voir ce submersible et je suis pas de�u ! Tr�s impressionnant, de la forme g�nerale tr�s fid�le et ENORME, aux details innombrables de l'interieur. Tr�s belle realisation !!! Tr�s beau travail, beaucoup de patience et d'abn�gation pour une r�ussite total. Quoting Tim McCumber Excellent. What an awesome build. Just beautiful. Excellent. What an awesome build. Just beautiful. Quoting TheSpectre 117 Erm...do you know any good doctor that can stop me from drooling?? ?xD Its amazing!!! Erm...do you know any good doctor that can stop me from drooling?? ?xD Its amazing!!! Quoting Rick S. wow! this is really cool and big! i love the details on it. 5/5! and thanks for the comment on my cuda! wow! this is really cool and big! i love the details on it. 5/5! and thanks for the comment on my cuda! Quoting Tommy Mizzone Sorry I haven't been able to comment. I love the new pics! It looks great!! Cool new attachments! One of the best subs out there!! Sorry I haven't been able to comment. I love the new pics! It looks great!! Cool new attachments! One of the best subs out there!! Quoting tony faircloth Really Cool Man, Very Thought Out Very Nice Details. I Bet You Have A Large Collection, Thanks For The Comment On My Truck! Really Cool Man, Very Thought Out Very Nice Details. I Bet You Have A Large Collection, Thanks For The Comment On My Truck! That thing is massive... and so well detailed! The interior is especially nice, and all the extra functions really brought it up a notch. Quoting Tremolo . This is absolutely great! Very impressive! This is absolutely great! Very impressive! Quoting ThunderT0D :) Titan Mecha vs Titan Nuclear submarine... Sub wins by obviously comparing the two! Titan is 5 times bigger than Titan! This is amazing! Some people would just make a cool outer part of a vehicle, but this has cool inside too! what else could happen to make it better? Keep it up! Quoting Nick Doyle Yes, this is a very time consuming hobby... But we love it! Titan Mecha vs Titan Nuclear submarine... Sub wins by obviously comparing the two! Titan is 5 times bigger than Titan! This is amazing! Some people would just make a cool outer part of a vehicle, but this has cool inside too! what else could happen to make it better? Keep it up! Yes, this is a very time consuming hobby... But we love it! Quoting Nick Doyle Wow...must've taken some time.The interior is such a great detailed area that (in my opinion) makes the MOC. Excellent job! Quoting Brendan MacDonald WOW! What an incredible creation! Wow...must've taken some time.The interior is such a great detailed area that (in my opinion) makes the MOC. Excellent job! WOW! What an incredible creation! Quoting Dreadnought o_o Your new sub is greatly improved. The interior detail is very awsome, I love the missiles, tropedos, and the nuclear generators. Very good job. 5/5. I will probably never make a sub agian since Im not interested in that anymore. Its hard work that I dont have the time for. You do a nice job on your subs. Did you ever think of making it with SNOT, Studs Not On Top, technique. Your new sub is greatly improved. The interior detail is very awsome, I love the missiles, tropedos, and the nuclear generators. Very good job. 5/5. I will probably never make a sub agian since Im not interested in that anymore. Its hard work that I dont have the time for. You do a nice job on your subs. Did you ever think of making it with SNOT, Studs Not On Top, technique. Quoting Athanasios Lazarou Very good! I really like the minifig scale, and the detail you've managed to achieve with something this MASSIVE is awesome. Congratulations! Very good! I really like the minifig scale, and the detail you've managed to achieve with something this MASSIVE is awesome. Congratulations! Quoting Joseph Merzl Nice work sir! The remodeling of the interior looks fantastic, you just don't see too many minifig scale military subs around these parts. Nice work sir! The remodeling of the interior looks fantastic, you just don't see too many minifig scale military subs around these parts. Quoting Mark Kelso Great work! All of the interior detailing is wonderful, and reminds me of some of the cool Dan Jassim pieces that inspired me a while back. It'd be nice to see you make a stand for this so it could be displayed (love to see this at a con some time, too!). Nicely done! Great work! All of the interior detailing is wonderful, and reminds me of some of the cool Dan Jassim pieces that inspired me a while back. It'd be nice to see you make a stand for this so it could be displayed (love to see this at a con some time, too!). Nicely done! Quoting antonio meny wow really amazing! is really great but most of all beautiful!! how many pieces did you use? Thanks Antonio! I used arround 7800 bricks. wow really amazing! is really great but most of all beautiful!! how many pieces did you use? wow davvero spettacolare !!! � davvero grande ma soprattutto bello !!!! quanti pezzi hai usato ? Quoting Wybie . wow , that must have taken ages !!! really awesome ! wow , that must have taken ages !!! really awesome ! Quoting Sean . OH. MY. GOD. this is freaking amazing! Just make sure it doesn't fall off the shelf. Thanks Sean! I would be so sad about it, and I think it would not only unmount, but break the bricks, because of its own structure/weigh! OH. MY. GOD. this is freaking amazing! Just make sure it doesn't fall off the shelf. Quoting De Tomaso Pantera This is incredible! 20kgs lol. So much detail i just wat to play with it lol. I've allways wanted to build a sub but don't have that amount of Lego :( Very well done i'm amazed! This is incredible! 20kgs lol. So much detail i just wat to play with it lol. 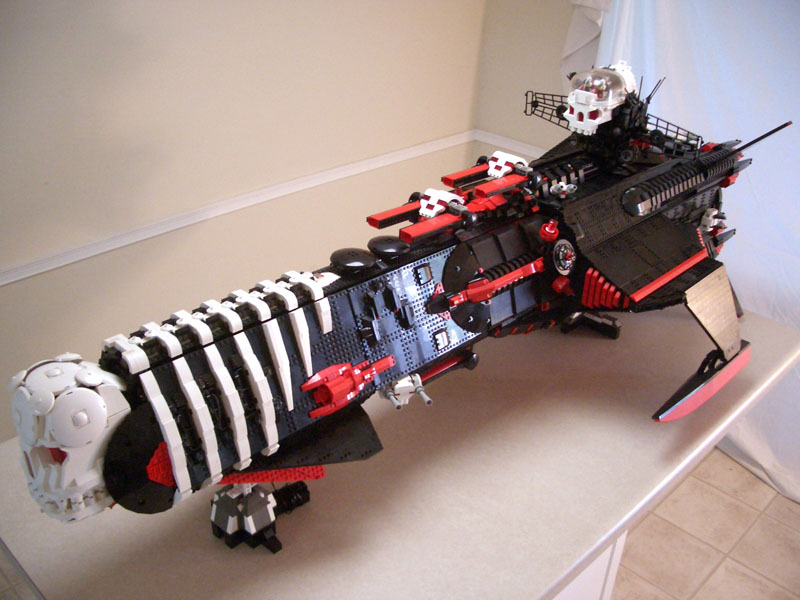 I've allways wanted to build a sub but don't have that amount of Lego :( Very well done i'm amazed! Quoting charles scholl Actually i lost all my work on space miner . my ldd crashed when downloading the upgrade. but the new features allow for more options .the lego universe upgrade on the ldd added alot of old parts i wanted but cant purchase them through the design by me . But be on the look out for either an updated space miner , or second version with details changed that i needed to make . Most of space miner was compartment build and then structural additions to make it stronger with thinner walls to allow for doors and hatches. Actually i lost all my work on space miner . my ldd crashed when downloading the upgrade. but the new features allow for more options .the lego universe upgrade on the ldd added alot of old parts i wanted but cant purchase them through the design by me . But be on the look out for either an updated space miner , or second version with details changed that i needed to make . Most of space miner was compartment build and then structural additions to make it stronger with thinner walls to allow for doors and hatches. Quoting charles scholl Hey Jay ! Awesome job . i like the detailed interior and exterior shots . but i do have a question . Did you use any technic pieces in the upgrade? Hey Jay ! Awesome job . i like the detailed interior and exterior shots . but i do have a question . Did you use any technic pieces in the upgrade? Quoting vincenzo Sciortino Jay ma langue est le fran�ais, mais je sais tr�s bien parler anglais. Mais quand tu me fait des commentaires je voudrais que tu m'�crie en fran�ais pour qu'on puisse mieux se comprendre.Le commentaire que tu ma fais je ne le comprent pas. Je comprent pas au complet. Jay ma langue est le fran�ais, mais je sais tr�s bien parler anglais. Mais quand tu me fait des commentaires je voudrais que tu m'�crie en fran�ais pour qu'on puisse mieux se comprendre.Le commentaire que tu ma fais je ne le comprent pas. Je comprent pas au complet. Quoting vincenzo Sciortino Jay ce matin j'ai mis mes nouvelles photos sur mon u-boat ce n'est pas de gros changements, mais si tu veux va voir.Mais toi tu a de la chanse, car tu avais plusieurs lego noirs. Moi j'aurai �t� heureux d'avoir autent de lego noir.Dit toi que depuis 20 ans tu na pas fai de lego, mais l� tu a fais tout un proget! Jay ce matin j'ai mis mes nouvelles photos sur mon u-boat ce n'est pas de gros changements, mais si tu veux va voir.Mais toi tu a de la chanse, car tu avais plusieurs lego noirs. Moi j'aurai �t� heureux d'avoir autent de lego noir.Dit toi que depuis 20 ans tu na pas fai de lego, mais l� tu a fais tout un proget! Quoting Nick Barrett Wow, I'm blown away by this! Like you say, not many submarines on MOCpages but, even if there were, this would still stand out for it's level of detail and sheer size! Wow, I'm blown away by this! Like you say, not many submarines on MOCpages but, even if there were, this would still stand out for it's level of detail and sheer size! Quoting tj kronen this thing is like the architect work for the real deal... its breathtaking really, it is truly an outstanding peice of work you have here, thank you for sharing! this thing is like the architect work for the real deal... its breathtaking really, it is truly an outstanding peice of work you have here, thank you for sharing! Quoting Nick S Nice work. Love the MOC! The detail in the sub is excellent. Nice work. Love the MOC! The detail in the sub is excellent. Quoting vincenzo Sciortino Jay j�ai un livre chez moi sur les sous-marin. Je le regardai et soudain j�ai vue le sous-marin Titan. Et je me suis rappel� que toi tu avais fais ce �norme sous-marin et sans blague tu a fais la r�plique exacte, mais en lego. Tr�s beau travail encore.Je adore tes nombreux d�tails. Jay j�ai un livre chez moi sur les sous-marin. Je le regardai et soudain j�ai vue le sous-marin Titan. Et je me suis rappel� que toi tu avais fais ce �norme sous-marin et sans blague tu a fais la r�plique exacte, mais en lego. Tr�s beau travail encore.Je adore tes nombreux d�tails. Hey Man, Thanks For Joining The Group, No Need To Thank Me, Really, The Group Would Be Nothing Without Any Of You. You Mentioned Something About Using LDD, Figured I Should Bring This To Your Attention, http://www.mocpages.com/moc.php/261383, I Hope It Helps. Quoting Andrew AKA Hump-Free Hey Man, Thanks For Joining The Group, No Need To Thank Me, Really, The Group Would Be Nothing Without Any Of You. You Mentioned Something About Using LDD, Figured I Should Bring This To Your Attention, http://www.mocpages.com/moc.php/261383, I Hope It Helps. I'll enjoy to share with you about LDD and its limitations! Quoting vincenzo Sciortino Tr�s beau Jay tu a fait du beau travail. Je suis en retard, mais merci de m'avoir donn� un commentaire sur mon u-boat. C'est un plaisir, entre fan Subs! Quoting Pouzet Nathalie FORMIDABLE J�r�me !!!! j'adooooore !!!!! FORMIDABLE J�r�me !!!! j'adooooore !!!!! Tr�s beau Jay tu a fait du beau travail. Je suis en retard, mais merci de m'avoir donn� un commentaire sur mon u-boat. Quoting Tom Simon Whatever shortage of subs there may be here, you are more than making up for it. I prefer quality before quantity, anyway. And you are not sparing any effort here. Bravo! Whatever shortage of subs there may be here, you are more than making up for it. I prefer quality before quantity, anyway. And you are not sparing any effort here. Bravo! Really nice! awesome build. I like the size of it. Hugeness! Quoting Rolling bricks Really nice! awesome build. I like the size of it. Hugeness! Quoting Dr. HappyBaboon , PhD Amazing! Would that I had that amount of black bricks. I could rule the world! The front slope is especially well done, in my opinion, and the details are spectacular! Keep on brickin'! Quoting Marc Auerbach I changed my own MOC main image as a test and it worked fine. Just edit your page and choose "Add Image". After uploading you will be given the choice to select a main image (and a layout) just like a new MOC. Once you choose them you should be returned to the MOC page you were editing and in a few seconds your main image should change. Amazing! Would that I had that amount of black bricks. I could rule the world! The front slope is especially well done, in my opinion, and the details are spectacular! Keep on brickin'! I changed my own MOC main image as a test and it worked fine. Just edit your page and choose "Add Image". After uploading you will be given the choice to select a main image (and a layout) just like a new MOC. Once you choose them you should be returned to the MOC page you were editing and in a few seconds your main image should change. Quoting David Calvet Je vote pour la base secr�te sous-marine ! �a me semble �tre une excellente id�e ! Je vote pour la base secr�te sous-marine ! �a me semble �tre une excellente id�e ! Quoting David Calvet Je reste sans voix..... C'est vrai que si tu avais un �quipage plus fourni, �a serait encore mieux: il semble un peu vide cet �norme sous-marin ! Je reste sans voix..... C'est vrai que si tu avais un �quipage plus fourni, �a serait encore mieux: il semble un peu vide cet �norme sous-marin ! Quoting Marc Auerbach Jaw-dropping. I know what you mean about not sleeping and eating. The problem with sleeping is always waking up with new ideas! Jaw-dropping. I know what you mean about not sleeping and eating. The problem with sleeping is always waking up with new ideas! Quoting Country Biscuit Wow. I'm, speechless. Quoting Nate Flood Great pics Jay! It really puts everything in perspective when you are holding it up. Thanks Nate, very happy to show you! Quoting cyberfrank 2010 are the pics cleaner? the pics of it on the shelf are new! so nice, i wish, some day, you also build a key for it on the shelf, with a building, and figs, for maintenance, i ve seen it elsewhere, and it was magnificient! if i ever see it again, i ll show it to you jay! are the pics cleaner? the pics of it on the shelf are new! so nice, i wish, some day, you also build a key for it on the shelf, with a building, and figs, for maintenance, i ve seen it elsewhere, and it was magnificient! if i ever see it again, i ll show it to you jay! Great pics Jay! It really puts everything in perspective when you are holding it up. Quoting cyberfrank 2010 t a pas une chaine comme wal mart ou toys r us? moi j attends des fois des supers deals de liquidation! c en est a pleurer, combien on paye sinon! c est temps ci c est les jeux lego, 1/2 prix souvent, tu serait surpris combien il y as de mcx! Si, on a toys R us, c'est vrai. t a pas une chaine comme wal mart ou toys r us? moi j attends des fois des supers deals de liquidation! c en est a pleurer, combien on paye sinon! c est temps ci c est les jeux lego, 1/2 prix souvent, tu serait surpris combien il y as de mcx! Quoting cyberfrank 2010 et pour les figs? ton sub aurait plus d impact avec un equipage digne de tes efforts! ton sub, c est vraiment ton bebe, le capitaine est noir! et les matelots blancs, ca serait vraiment eclatant! j insiste seulement parce que je trouves que tu le merites, parce que ton sub c est vraiment une oeuvre d art! bravo encore! Merci! C'est vrai que je le reve depuis novembre 2010 maintenant... Je n'en pouvais plus d'attendre mes pi�ces, � chaque fois! :-) Et tu te les procure ou toi tes figs, sur le net? J'aurais aim� avoir une tenue de scaphandrier sympa, pour un de mes gars! Le mien est tout gris! Beurk! En m�me temps, on ne les voit pas forcemment beaucoup. et pour les figs? ton sub aurait plus d impact avec un equipage digne de tes efforts! ton sub, c est vraiment ton bebe, le capitaine est noir! et les matelots blancs, ca serait vraiment eclatant! j insiste seulement parce que je trouves que tu le merites, parce que ton sub c est vraiment une oeuvre d art! bravo encore! Quoting cyberfrank 2010 merci pour tes commentaires jay! j ai pense a toi en revenant du wal mart, les figs 4 sont la! j ai pris un matelot! si tu pouvait t en procurer ca serait pas mal cool! aussi, j ai un VRAI capitaine qui serait super pour ton sub! tu peut t en procurer un avec la collection d essentiels de ville! tu peut en trouver parlego ou lego education! check ma page de lego education pour en savoir plus! ton sub! ; extra ordinaire! magnifique! un reve devenu realite! je suis pret a le comparer avec n importe quel vaisseau [espace pirate] et il s en sort dans les meilleurs resultats possibles! tout est incroyable a propos de ton sub! interieurs, fonctions, details, finition, couleurs, touches personelles et futuristes, [les vitres] ameliorations? ; il y as des techniques pour ameliorer les flancs, il y as un gars que je vais te referer, qui travaille fort sur des avions, ses techniques pouraient te servir a aller plus loin encore! steffen kasleimer! c est presque aussi fort que toi sauf, des avions de lignes! il faudrait que ton sub ouvre sur la longueur si possible, pour pouvoir mieux admirer ton explication de la fonction d un sub nucleaire, ou plutot ta version, t es tu base sur le plan d un vrai? 3 ieme; le cannon anti aerien serait surement mieux avec du technique! jay, t es tres fort!!! merci pour tes commentaires jay! j ai pense a toi en revenant du wal mart, les figs 4 sont la! j ai pris un matelot! si tu pouvait t en procurer ca serait pas mal cool! aussi, j ai un VRAI capitaine qui serait super pour ton sub! tu peut t en procurer un avec la collection d essentiels de ville! tu peut en trouver parlego ou lego education! check ma page de lego education pour en savoir plus! ton sub! ; extra ordinaire! magnifique! un reve devenu realite! je suis pret a le comparer avec n importe quel vaisseau [espace pirate] et il s en sort dans les meilleurs resultats possibles! tout est incroyable a propos de ton sub! interieurs, fonctions, details, finition, couleurs, touches personelles et futuristes, [les vitres] ameliorations? ; il y as des techniques pour ameliorer les flancs, il y as un gars que je vais te referer, qui travaille fort sur des avions, ses techniques pouraient te servir a aller plus loin encore! steffen kasleimer! c est presque aussi fort que toi sauf, des avions de lignes! il faudrait que ton sub ouvre sur la longueur si possible, pour pouvoir mieux admirer ton explication de la fonction d un sub nucleaire, ou plutot ta version, t es tu base sur le plan d un vrai? 3 ieme; le cannon anti aerien serait surement mieux avec du technique! jay, t es tres fort!!! Quoting charles scholl Now thats what i call improving !!!!! now ya done one uped me jay lol. looks great. especially like the engine room detail and the added missile silo's. awesome keep up the good work . Thanks Helena! Lol, I think you voted twice! Now thats what i call improving !!!!! now ya done one uped me jay lol. looks great. especially like the engine room detail and the added missile silo's. awesome keep up the good work . Quoting Paul Wellington Great job! I can't believe you modeled the interior. Great job! I can't believe you modeled the interior. Quoting Bob the inconceivably invincible Awesome! I like the work you did with the interior! Awesome! I like the work you did with the interior! Quoting Josiah Gillespie Well done. This is great, especially since you were able to build it with the limited types of pieces that LDD has. I love the interior detail. You right, Josiah! I could have made so much cool systems, with more technic brics, and rotatives or opening bricks are colour range limited! I thank anyway Lego Designer, because i had not made LEGOS since i'm a child, and i'm quite in touch with computers(in my job, i make them work), so I think it was a "soft" way to bring me back to them. Well done. This is great, especially since you were able to build it with the limited types of pieces that LDD has. I love the interior detail. Quoting Brian Hastings Hey - nice submarine; it has the look of a Typhoon class SSBN, except that the missiles are aft of the sail. Can't believe you had the patience to design all of that on the computer first... kudos for that! The longer design really helps it look a bit less blocky, though that's a challenge, especially with modern sub shapes. Thanks for the kudos! Brian! I might have left legos for too much years, so that i might have found that starting a new creation with LDD was quite funny! Anyway, i did't have any brick to start, and I think LDD was a convenient way to know where i was going in my project! (i first did not know if i was going to buy the real model, depending upon my satisfaction and the price) I tried my best not to do a blocky shape, with a quite simple structure... Hope I managed that! Hey - nice submarine; it has the look of a Typhoon class SSBN, except that the missiles are aft of the sail. Can't believe you had the patience to design all of that on the computer first... kudos for that! The longer design really helps it look a bit less blocky, though that's a challenge, especially with modern sub shapes. Quoting Danny Morgan Whoooaaaa, are you going to buy it? I think I prefer this one to your last (although they're both incredible) because of the longer, sleeker, more deadly shape and look. Btw thanks for the comments! Whoooaaaa, are you going to buy it? I think I prefer this one to your last (although they're both incredible) because of the longer, sleeker, more deadly shape and look. Btw thanks for the comments! Quoting Brickster ~ Sweet! Thanks for commenting on a TON of my stuff! Sweet! Thanks for commenting on a TON of my stuff! Quoting Dreadnought o_o Nice sub. I never liked nuclear submarines as much as wwii ones. Its the round shape compared to the sleek sharp shape. I dont think I will improve on my gato because there are a lot of better sub builders out there then me. I want to get into tall sail ships (pirate ships). You did a good job. I dont like to use Ldd with big creations because it requires patience. I like the detail on the inside, The reactors, missile tubes, life boat, and that yellow thingy looked awesome. Also does the crew compartment look the same as your old sub because it looked good too. 4/5. Nice sub. I never liked nuclear submarines as much as wwii ones. Its the round shape compared to the sleek sharp shape. I dont think I will improve on my gato because there are a lot of better sub builders out there then me. I want to get into tall sail ships (pirate ships). You did a good job. I dont like to use Ldd with big creations because it requires patience. I like the detail on the inside, The reactors, missile tubes, life boat, and that yellow thingy looked awesome. Also does the crew compartment look the same as your old sub because it looked good too. 4/5. Quoting Mardios lambda I like your changes to the previous model, with very nice ideas such as survival capsule. When will a new model? Thanks Mardios and Vladchris! My order has been passed yersterday evening... If you're talking about a new creation... I don't know, i have to deal with this before! I can't wait to receive my bricks! I like your changes to the previous model, with very nice ideas such as survival capsule. When will a new model? Quoting charles scholl hey jay anytime . i would Actually like to Hear some of your idea's and advice. sometimes the designer program stumps me when im brain storming . hey jay anytime . i would Actually like to Hear some of your idea's and advice. sometimes the designer program stumps me when im brain storming . Quoting charles scholl Hey Jay! this is awesome . i see your alot better at detail work then i am . very good job . i especially like the escape pod. very creative. Hey Jay! this is awesome . i see your alot better at detail work then i am . very good job . i especially like the escape pod. very creative. Hi Victor! i'm about to order the new bricks: yersterday my credit card could not handle this, but i will tomorrow or on friday. Can't wait to mount the new version(even if i'm a little afraid of the rear unmounting)! So you've managed to make LDD work again? Impressive project also. Will you acutally be building this in real bricks�? I love the yellow/red/blue interior. It really presents the details well. Thanks Victor! Do you like the idea of the machine gun tourret? I found some defense system was missing. Excuse me but what do you call a stud?